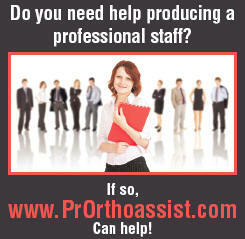 PrOrthoAssist.com trains your orthodontic assistant like a you would, if you only had time. Sign up for unlimited access for $100 per month. Satisfaction guaranteed. Cancel for a full refund if not satisfied. This site performs best using a broad band connection and Internet Explorer, but it can be used with a dial up connection and other browsers. Orthodontic assistant training had never been easier! Training topics include terminology, tooth identification, orthodontic appliances, OSHA and infection control, orthodontic pliers and instruments, patient education and understanding insurance. Step by step guides to records taking, dental photography, banding, bonding, debonding, impressions and model pouring are included. Once you have completed the basics, you are ready for the Beyond the Basics lessons. Advanced topics include: customer service, telephone etiquette, successful hiring techniques, understanding the business of dentistry, principles of collections and meeting patient expectations. PrOrthoAssist.com offers business training as well as clinical dental training. Online training ensures access 24 hours per day, Train 7 days per week from anywhere! 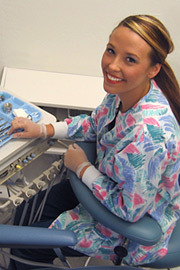 Orthodontic assistant training is now easy, convenient and available to your entire staff. Satisfaction is guaranteed. If you are not satisfied with PrOrthoAssist.com, simply CANCEL WITHIN 48 HOURS OF PURCHASE in order to receive a FULL refund. Orthodontic material authored by Julie S. Worthington D.D.S., M.S.